Alice at the age of three. Even as a very young girl, Alice had great force of personality. The photo shows Alice’s mom, her sister Ann and baby brother Herbert when Alice was about three years old. (The two girls on the left are neighbors.) It was taken in Marfa Texas, where her father was stationed in the US Army. Alice is of course the one on the right, who obviously does not want to be there, and has better things to do. Alice has always been determined with little doubt about what she wants to accomplish. Alice had a happy childhood. 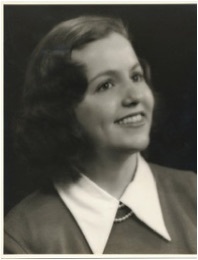 She has maintained close relationships with her sister Ann and brothers Herbert and Donald. This was a strong family. She was an Army brat, which meant that her home was not so much where she lived but with whom she lived. Her father was an officer in the US Army, and served in World War II. In her adolescence Alice spent a year in Germany shortly after the war. After graduating from high school, in Leavenworth, Kansas, she went off to Stanford University to study. She started college at age 16. 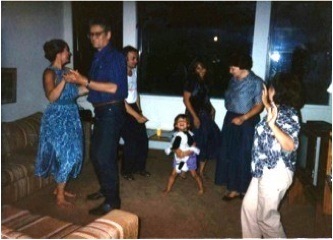 Between her first two years of college, at about the age shown in the photo on the left, she spent a year in Ecuador where her father was the Military Attache to the US Embassy. 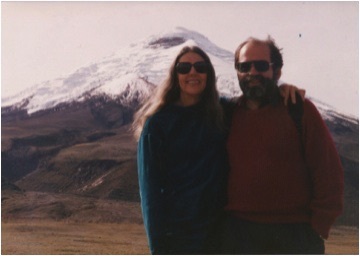 She developed a life long love of Andean culture, and the high mountains. She got married at the end of her sophomore year, and not long afterwards, had her three children. Her youngest child, Rachel was born on the way to the hospital, a feat equalled years later when Rachel had her own daughter, Emily Rose, delivered by the local fire department. 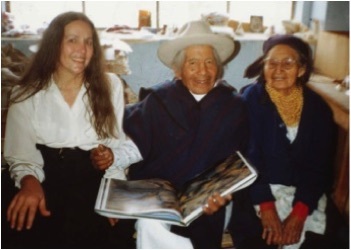 Years later, with children, she got her PhD in Anthropology from the University of California at Berkeley, specializing in the culture and archeology of the indigenous people of the Andes. She did a year’s field work living with her three children in a small village in Ecuador. Alice was always tough. It was hard work raising Stephen, David and Rachel, much of the time as a single mom. She did very well. 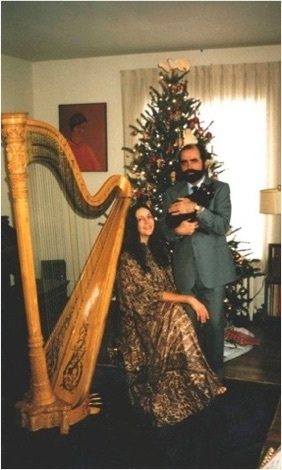 When I met Alice, in 1976, her children were almost grown. 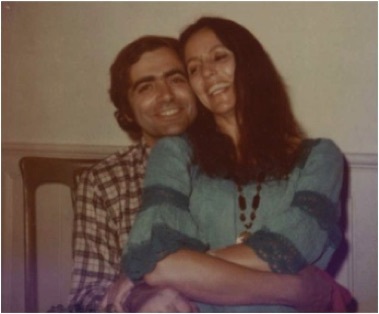 Her son Stephen was in graduate school in biology at the University of Southern California. 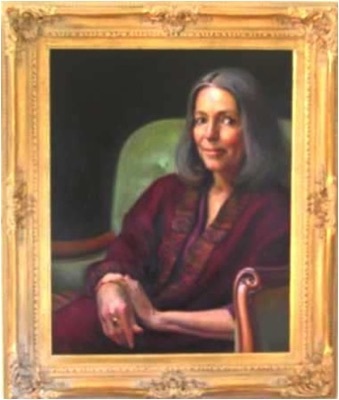 Her son David was an undergraduate at Wesleyan College in Connecticut, and her daughter Rachel was off to explore the world in California. 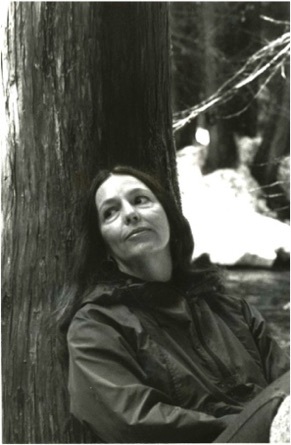 From the time she had been at Stanford, she had raised her children, gotten her BA and PhD at Berkeley, done field work in Ecuador twice, been a professor at the State University of New York in Cortland, moved to Boston and gotten a Masters degree in public health at Harvard, and was at the time evaluating mental health programs at the Massachusetts Mental Health Center. The picture at age three reflects much of the strength of her will and determination. We met when I was in Boston doing postdoctoral work at MIT. 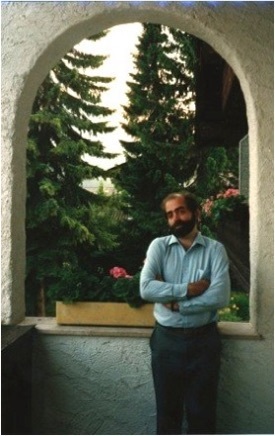 I had just finished my PhD at the University of Washington in Seattle. I had never lived anywhere other than Washington State. I was sharing a house with a psychiatrist and a MD, replacing another physicist, Bob Jaffe, who had been teaching at MIT but had gone to California for a year’s visit. Alice and the psychiatrist were old friends, and one night shortly after my arrival she was a guest at dinner. I somehow overcame my shyness and began talking with her . The subject got to cockroaches, and Alice discovered I had never seen them. She was having a dinner party soon, so she invited me to come take a look at some of hers. I began going to her dinner parties, but I was very quiet, and did not know what to talk about. I was really overwhelmed by all of her friends and their sophistication. I enjoyed the food enormously, as Alice has always been a great chef, and somehow there was good chemistry between us, so I kept getting invitations. We had a golden retriever in the house called Sappho, named of course by the psychiatrist. I remember one of Alice’s early visits. She was wearing a white dress and was drop dead gorgeous. She had sat down with a glass of sherry in her hand. Sappho had just come inside, with muddy feet. We had trained Sappho to have a taste for sherry. Seeing Alice with a glass, she went bounding across the room, jumped into Alice’s lap, and slopped up her sherry. This is one of the few times I have seen Alice speechless. Finally, I got the courage to ask her out. We went to the Wine Bar in Harvard Square in Cambridge. The restaurant had its own wine store attached, and you went to the racks and bought a bottle for dinner. I knew nothing about wine, but had a theory that if it cost a lot and had a picture of a house on it, it would be OK, and it was. Alice remembers that we began with artichokes and we ended with a hazelnut tort. After dating for a couple of months, we decided to get married. Our relationship has always been a little unusual. We have very different backgrounds, and different ages. Nevertheless, we both are very determined people, with strong values. We particularly respect loyalty and honesty. Alice has taught me many things of the mind during our marriage, and I have been fortunate to take her to many interesting places. We have five wonderful grandchildren, with whom I am very close. Things started well, and they have lasted well . While in Boston, we rehabbed an aged house together. Alice was buying the house before we got married, and I helped her paint, restore floors etc. I discovered she knew a lot about carpentry and renovation. This was the first house of several that we have rehabbed. We could not afford to buy something that was fixed up for most of our marriage. Our wedding was in an Episcopalian Church in Brookline. When the priest asked if anyone objected to the marriage, a cat that had walked in through the open door to the church meowed. “I don’t think he’s objecting,” the priest said. We ourselves took it as approval. At that time we had a couple of cats; we could never turn away a stray. We also raised a litter of kittens from our Siamese cat Zelda. Zelda loved to sit in our lap. She had earlier lived with a family that did not pay her much attention, and with us she was in heaven. When she had her kittens, she promptly moved them all into our bed. We had to place pillows all around the bed so that when the kittens fell off they would not be hurt. After the wedding, our reception was in the house we were rehabbing in Brookline. It was a potluck, and a thoroughly nice affair. We hadn’t quite finished painting all the rooms, but we had vases of lilacs from the garden in all the rooms, and the food our guests had brought to share was wonderful. It was a happy day. After I finished three years at MIT, we went on to California, where I was a postdoctoral fellow at the Stanford Linear Accelerator Center. Alice could have taken a job working in San Francisco superficially similar to that she had left it Boston, but it seemed a less pleasant hospital and would have required a long commute. Instead, she began working as an administrator for a local therapist, Emmett Miller , an M.D. who specialized in hypnotherapy. For many years, I used his tapes to help with migraine headaches. One of her fringe benefits was free massages from Sandy, Emmet’s soon to be wife. 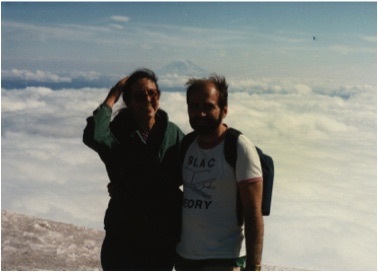 We moved to Seattle in 1980, where I took an assistant professorship. 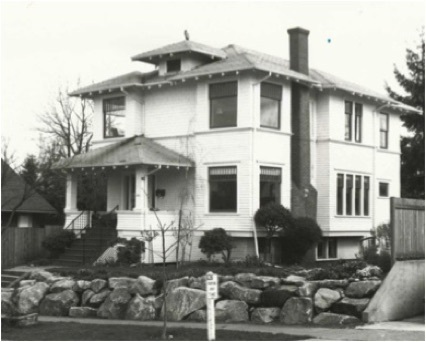 We bought another old broken down house in the University District and began working on it. The house was a beautiful old one, built in 1904. (The house has recently been demolished and replaced by eight tacky town houses.) It cost $100,000, which seems cheap now. We got a real bargain on the interest rates, 12%, financed by the owner. Interest rates were typically 18%, because of the huge inflation bubble of the Carter era. My salary was about $25,000 per year, so it was not easy to make ends meet. Alice took a series of temporary jobs -- as an administrative assistant at the local Yeshiva and later reorganizing the U.W. Career Center, etc. Alice in our Seattle house. Alice developed a very long term friendship with a woman who was living next door for a year, Nakhee Kim. 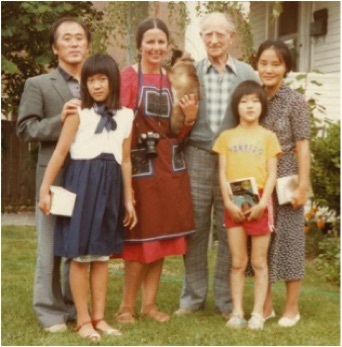 Nakhee is a Korean poet, and her husband was on sabbatical for a year at the University of Washington. We have maintained contact with the Kims through the years. 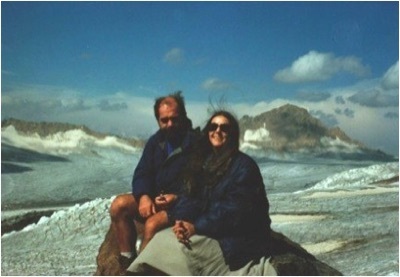 Their son, Cheesup, visited us one summer when he was a young adult in Aspen, and I took him hiking in some really wild places. I remember the look on his face as we descended a very steep trail overlooking a valley. He was a little scared, but he was not going to admit it. Later he did graduate work in mathematics, and then trained to be a Catholic priest -- but has decided to go back to teaching math. 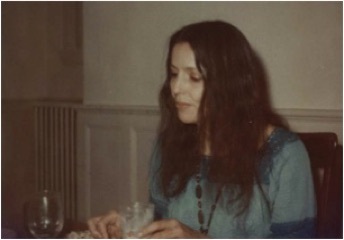 Alice also was very good friends with Doris, the wife of my graduate student Mark Bernstein, She was a talented young artist, and in our house we have two of her painting. She was a sparkling young lady. We have recently regained contact with her. Her husband Mark became a researcher at Lincoln Labs in Massachusetts. After three years in Seattle, it was apparent I would have difficulty getting tenure at the University of Washington. My choice of field of research, about the properties of the Quark Gluon Plasma and ultra-relativistic heavy ion collisions, which has formed the backbone of my career in physics, was not at all popular among the faculty. 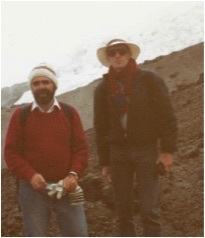 I did receive tenure at Seattle, but my mentor and colleague James Bjorken orchestrated a permanent faculty position for me at Fermi National Accelerator Laboratory, which I accepted. 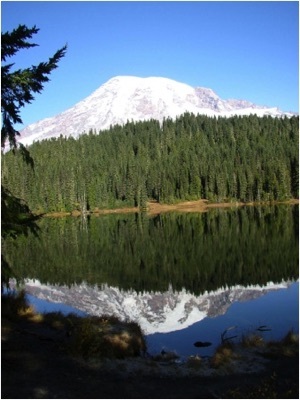 Photos of Mount Rainier taken by Alice. Alice was heartbroken to leave Seattle. She really loved the house and the nearby mountains. I think for the only time in her life, she had assumed she would stay forever somewhere. Her eldest son had also relocated to Seattle, married, and produced her first grandson, Matt. 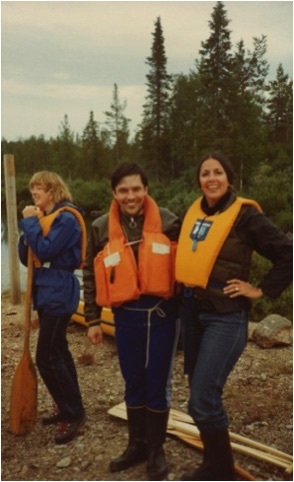 As we were preparing to move away, we went camping with the Bernsteins in Ohanapecosh. Ohanapecosh campground is on the beautiful river of the same name, in a little valley surrounded by giant firs and cedars. The rocks are all covered with moss, and the water in the stream is like crystal. There are hot springs nearby, which used to be the focus of a now totally decayed lodge. 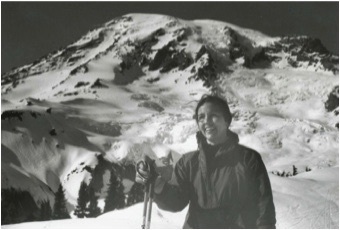 It was sitting beside the river that Alice thought of the story that became her first picture book, “The Mountain that Loved a Bird.” It was partly born of the sadness of leaving Seattle. We of course return to Seattle quite often as we have friends and family in the area. 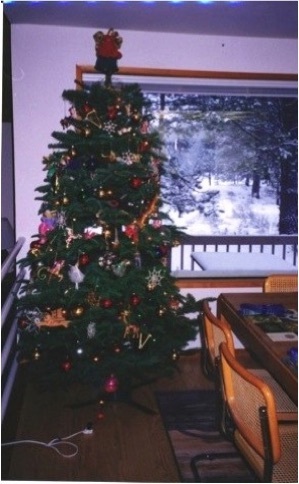 We also now own a house in Sunriver in the middle of the Oregon Cascades, which attracts us out to the Northwest in the summer and around Christmas. 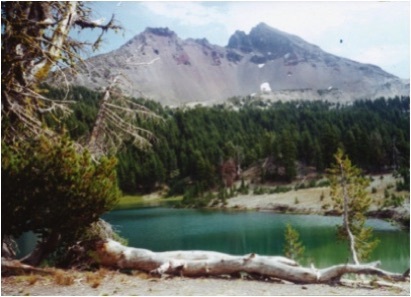 On one of those trips, a few years after leaving Seattle, I took the photo on the right of Alice sitting under the tree where she wrote the “Mountain that Loved a Bird. I also had someone take a photo of the time we hiked up to Camp Muir on Mount Rainier. It was foggy and misty below, but we broke out of the low clouds to see truly magnificent views of Mount Adams and the snow field below. In retrospect, moving from Seattle was the best move we ever made. It took me from the idiosyncratic faculty at Seattle to a place full of excitement about physics, and less ideological about choice of research. For Alice, the sorrow of leaving was replaced by the pleasure of a new career as a children’s author. People from Seattle are often times perjoratively called moss backs, and I am afraid if we had stayed, that is how we would have ended. Nevertheless, it is a truly beautiful city. Fermilab is in the prairie outside of Chicago. The nearby towns are small, and sleepy. We bought the old Lutheran parsonage in Batavia. It was in fairly good condition, and only needed minor repairs. It was late Victorian in style, and had high ceilings and nice wood floors. Prior to moving to Fermilab, I had begun traveling. (Most of my professional travels are described in the Anecdotal Vita.) 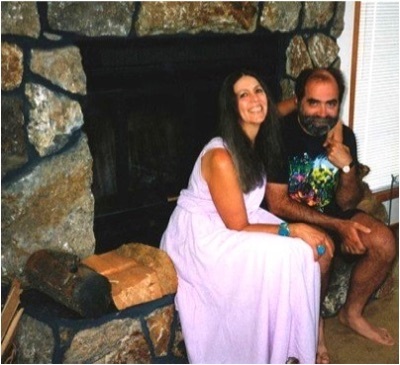 I had made professional friendships in Finland during my first visit to Europe, and Alice and I had travelled to Finland together for a three month stay about a year before moving to Fermilab.. We had lived in a small apartment in downtown Helsinki. Alice had made friends with a family headed by two doctors, the Kiistalas. Urpo Kiistala was totally un-Finnish; most Finnish men are notoriously reserved. Urpo was an extrovert by any culture’s standards. His driving was unnerving, since he would be talking non stop, turning his head to the back of the car so he could face you while he spoke. On a later visit, we stayed with them at their summer house on the coast of southwestern Finland. It was July, and the sun would never completely set, only dip briefly into the sea for a several-hour-long sunset as it traversed back from West to East. Alice and I went out in a row boat and fished, and caught about a dozen cod fish. The light reflecting on the water turned it to the color of molten metal. 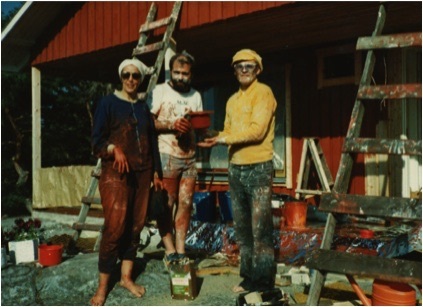 While at the Kiistala’s summer house, we helped them paint one of their homes. In the upper photo, Urpo is on the right. A popular color for Finnish summer houses is red. a very sheltered life. I had heard of him while a postdoc at MIT, since he was formulating what at that time seemed to be an absurd question: “Why do we live in four dimensions?” He was now trying to formulate a theory which would allow all of the order in nature to arise from underlying Chaos. Holga has a truly original and creative mind. When he gave his lectures, family members like Alice would come to hear him speak because of his dramatic style, and to hear the way he would pronounce Kaos. Holga always spoke very loudly with a strong Danish accent. Holga was at that time in his late thirties or perhaps early forties. His mother, who had taken care of him his whole life had recently died. He always aroused the maternal instinct in women. One night I and a friend were out in a boat in the fog fishing. All was quiet and in the distance we heard Holga’s voice, and the laughing of women. The sound came closer, and through the fog a boat appeared, with Holga sitting in the front, and three women rowing the boat for him. Later in the week, there was a canoe trip that Alice had signed up for; she planned to share a canoe with Holga, who had never rowed one. Holga arrived wearing a suit and tie; he had brought no casual clothes. Alice managed to borrow a sweat suit and rubber boots for him, he changed and they set out. 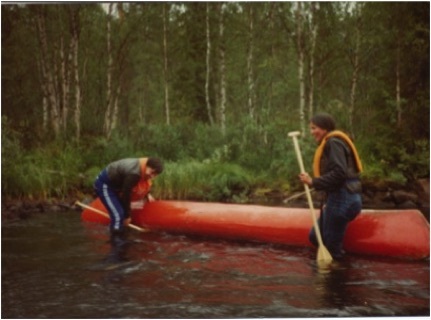 They tipped over many times, as Holga had no sense of how a canoe worked. Alice paddled in front, Holga behind her -- and his enthusiastic, strong rowing often steered them into rocks, upsetting the canoe. The water wasn’t deep, but Holga couldn’t swim. To help him, Alice would hold out her paddle to give him have something to hang on to. Holga has always insisted that Alice saved his life; he was proud that they had managed to arrive at the spot where the trip was to end. Alice and Holga preparing for their canoe adventure. keep Alice entertained, and allow me to go fishing. Among the Russians we met there were Yuri Makeenko and Misha Shepkin from the Institute for Theoretical and Experimental Physics and Mitya Diakonov from the Leningard Nuclear Physics Institute. Alice and I visited Leningrad and Moscow just before coming to Fermilab. We developed many friendships there, friendships that have lasted through the Cold War, the emigration of many of our colleagues from Russia and the hardships of our colleagues who remain in Russia. We were unusual in that Alice almost always travelled with me. In Finland, we had learned the virtues of discretion, and never spoke among ourselves while in Russia of anything we knew which was the least bit sensitive about our colleagues, nor until recently, to anyone else anywhere. Russia at that time was in the last stages of an evil and corrupt totalitarian system. People could lose there positions and even be imprisoned for perceived indiscretions. We were also ``non-denominational’’. At that time in Russia, there were two major schools of theoretical physicists: Those who were the product of Landau and those of Bogoliubov. The former were primarily Jewish and the latter were primarily not. We chose not to become involved in the conflicts between these groups, instead doing what we could to help out friends. This might involve bringing medicine for a sick child, or a message and a gift from a family member who had emigrated. I would almost always bring a suitcase full of books which I had finished reading and leave them with friends. I do not think I ever did anything illegal, but one never knew with Soviet Russia. 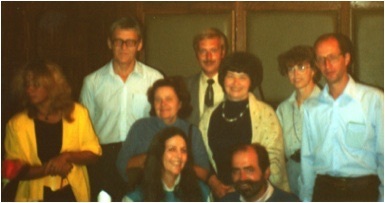 When we moved to Fermilab, Alice and I became friends with the delegations of Soviet scientists who were visiting the lab. We would have parties at our house in Batavia, and the Soviets, members of the theoretical physics group and other friends would be invited. I remember at one such party, the phones went on the fritz the Friday evening before the party on Saturday afternoon. A telephone repairman was at our house bright and early on Saturday morning to make repairs. You can draw your own conclusions. 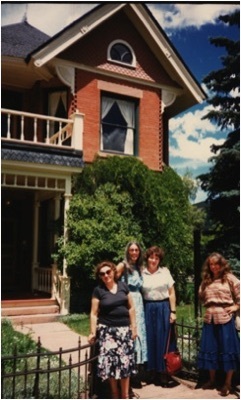 We once invited the entire Soviet experimental delegation to visit us in Aspen, where we were regularly spending about a month every summer. I was on the board of the Aspen Institute for Physics. Alice and I rented a large apartment for them, and they drove out to stay with us for a little over a week. It was a chance for the scientists and their family to see some of America. Russians love to fish, and the fishing is good in Aspen. One evening I took the nachalnik (Russian for boss) of the delegation fishing. I drove back down the curvy roads from Independence Pass and remember talking about how when you drive into corners you should go slow into them and then accelerate going out of them. The feel is like skiing. A few days later, the entire delegation was with me at a lake fishing, and I asked my friend Sergei Nurushev if he wanted to drive up with me to the pass. He answered no in an embarrassed way, and eventually admitted that the nachalnik had officially forbidden anyone to drive with me. The boss had been scared during the drive down from Independence pass a few days before. His wife teased him about this interminably, once she somehow found out. Alice’s closest friends at Fermilab were Olga and Lidia. She has kept in contact through the bad times for scientists during and after Gorbachev. These were times when in a city dedicated to science as was Protvino, there was 50% unemployment, and no one could move because there would be no housing available elsewhere. In Russia, you cannot simply move to a new job. Jobs are a lifetime commitment to Institution and place. Several years ago, I was to go to Moscow for meetings, and Alice could have visited Olga and Lidia in Moscow. It would have cost her no more, she discovered, to fly them both to France and share a small apartment with them there while I was gone. She rented the apartment and arranged the ticket for her friends. By this time, the problem for Russian’s visiting Paris was not the Russian government but the French. The French seemed to think that any Russian woman asking for a visa to France had no intention of returning. We solved this by asking help from our good friend Jean Paul Blaizot. Jean Paul is the top theoretical nuclear physicist in France, and very good in solving problems, physics and otherwise. He arranged that they visit as his guest, and certified with the Mayor of the small village in which he lived that they would be his responsibility. Alice remembers vividly the times they had together often. One of her favorite stories is about seeing a demonstration of left-wing students from the Sorbonne, the top liberal arts college in France, in support of faculty that were demanding higher wages. There were a number of policemen on hand to maintain order, but for all the red flags being waved, this particular rally was a quite tame affair, and no one appeared interested in the speeches. Alice and her friends sat at a cafe table nearby, watching it as a harmless entertainment. Finally in an attempt to inject a little liveliness in the affair, the demonstrators put their flags aside, joined hands, and began dancing in a circle -- singing a Russian tune. Alice’s friends broke into laughter. 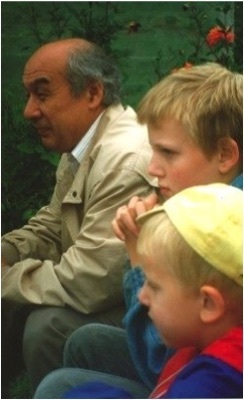 In the section Anecdotes, you will find a biographical sketch of Volodya Gribov. Gribov was one of the world’s top theoretical high energy physicists. We developed a friendship with him during a visit to Fermilab. Occasionally we would offer a Russian guest the hospitality of my home, so that the visitor would not be directly under the administrative constraints of the Soviet delegation to the lab. This was true for Volodya, and my friend Andrei Linde. Alice loved Volodya’s obsessive mind and his childlike fascination with ideas and music. Alice’s writing was going very well. 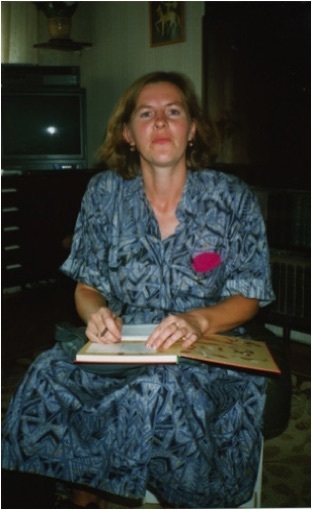 On one of the trips to Russia, she met with a Russian author, Natalia Romanova. Alice had seen one of her books ``Once There Was a Tree’’, illustrated by Gennady Spirin, and had loved both the book and illustrations. Russian illustrations of children’s nooks have a long tradition. The famous Russian artist, Biliben, illustrated classic Russian folktales. Alice also liked the story which Natalia had written. I remember going to the apartment where Alice was having tea with Natalia and her husband. A block away I saw blue smoke coming out of a window on about the fourth floor. I was worried there was a fire. I got to the apartment and found that Natalia’s husband had lit the charcoal powered samovar and was letting the smoke out through the window. Natalia’s husband was quite a character. He had been scheduled to be Khruschev’s translator during his visit to the US. The US government for some reason had not allowed this. He had recently been on the front of Ogonyek (Little Flame) Magazine, playing his accordion and proudly displaying all of his military medals from the war. He took me to the bath house across from the Lubyanka (the central KGB center in Moscow) and we enjoyed the steam bath and the swimming pool, and hit each other over the backs with birch branches. He told me that even during the darkest times of Stalin, after the baths, people in the locker rooms would speak their minds. Natalia translated ``The Mountain that Loved a Bird’’ into Russian, and helped Alice find a Russian publisher. There were 300,000 copies printed and sold. 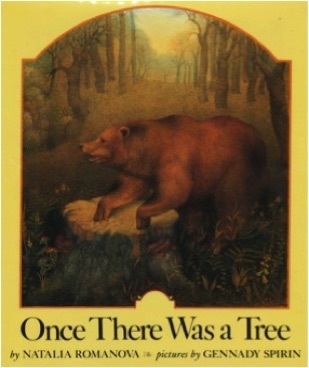 It was the first children’s book published in the U.S.S.R. by a modern American author. After living in Batavia Illinois for four years, I got an offer to go to the University of MInnesota, which I accepted. With some misgivings, we bought a house in the Uptown area of Minneapolis that required more rehab than any we had previously owned. This house had been superficially fixed up, but very little was actually functional. The furnace registered zero on the fuel efficiency test. If we had successfully got it to work, we would have blown up the house, since the ``remodelers’’ had removed the expansion tank for the radiator’s water system when they finished the attic space. The garage was near collapse, as was the front porch. A room had been added above the back porch and that porch itself were sinking; there was no foundation there. Water from the back yard cascaded into the basement every time it rained. A ``modernizing’’ of the kitchen had ruined the traffic pattern; there was no garbage disposal, and to take the garbage out one had to carry it though the pantry, the dining room, the living room, and a back hall. A too-large island left the kitchen feeling cramped. Most of the interior doors, and several windows, were missing. There was no insulation. The house nevertheless still had qualities of an architectural gem; it was built in the later 1800’s. It was in a neighborhood where Alice could walk to shopping, dance class, exercise, and close to major bus lines. So we gambled, and bought it. A few weeks after we moved in, we came back with a guest to find the front door open and our Oriental carpets lying halfway down the stairs. We had interrupted thieves in the middle of their work. So we got an alarm system. The extensive renovation continued for years. 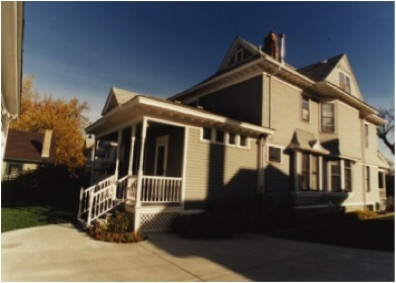 Upper left: Exterior of Minnesota house, after remodeling. I got involved in building the Theoretical Physics Institute (now the Fine Theoretical Physics Institute) at the University. The University had been given money from a local developer, Bill Fine, to endow some chairs in the physics department. Marvin Marshak , Steve Gasiorowicz and Alan Goldman in the physics department had leveraged that into a commitment by the University to support an Institute. I became its first director. At the time, Russia was beginning to fall apart, and friends from the Soviet Union were increasingly uneasy about their prospects in the USSR. What I did in Minnesota is explained in the Anecdotal Vita section of this website. Suffice it to say, I hired a number of Russians at the University of Minnesota. These were all top of the rank people, among the best of their generation anywhere in the world of physics. Alice of course was much involved with the Russians. She had a friendship with Natasha, the wife of Misha Voloshin. It was very hard for Natasha to leave Russia. On the other hand, Natasha was happy playing ice hockey on the frozen lakes of Minnesota. 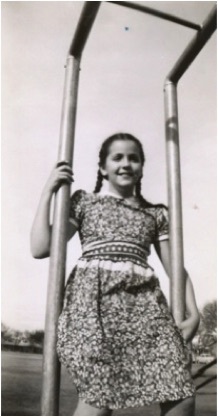 She loved to go out and would shyly ask the young men if she could try to play a little. Minnesotans, known for being nice, would let her play. She would promptly clean their clock, and probably made good money out of it too. She was a real skater. 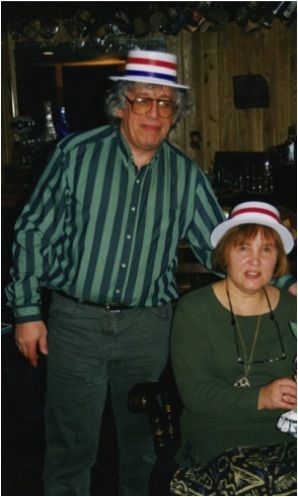 Nellie, the wife of Arkady Vainstein, was also a good friend. Nellie is very decisive and understood that Minnesota was her new home -- that if she and her husband wanted to take care of her children and grandchildren, there was little future in Russia. Nellie is a very strong woman, and there was a natural alliance between Nellie and Alice. Above: Alice and Natasha preparing for a night on the town. Arkady and Nellie Vainshtein proudly celebrating becoming US Citizens. Alice orchestrated a couple of memorable birthday celebrations for me and Arkady Vainshtein, who were born on essentially the same day. One time she hired a belly dancer; another time a flamenco dancer, together with an expert guitarist and a singer straight from Cordoba. 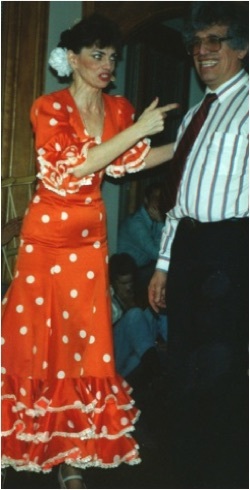 I remember the belly dancer arriving dancing into the room and Nellie Vainshtein holding tightly onto Arkady, who was much intrigued by the entertainment. Flamenco dancer and belly dancers at birthday parties at our home. I think that Arkady is being scolded in the middle photo for making a misstep. Alice’s writing was quite successful. 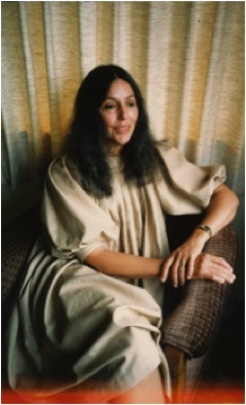 Roxaboxen, one of her strongest books, was published shortly after we arrived in Minnesota. This story was written while we were still at Fermilab. I remember we had gone to Garmisch-Partenkirchen in the Bavarian Alps for some hiking and vacation. We arrived and it rained and rained. ``Roxaboxen’’ was written during ten days of solid rain; Alice at least could use those days! When the rain finally stopped, one day we hiked up a valley to the Alpen Hutte. We did not have enough water, so I gave Alice all of mine. A few kilometers from the Hutte, I could hear beer bubbles popping and smell it in the breeze. When we arrived, we each drank about a liter of beer, rented a room, and after listening to some zither music, fell sound asleep. We awoke to heavy snow and about half a foot on the ground. That was the last of our vacation time -- but at least we had one lovely hike, and a book for Alice! 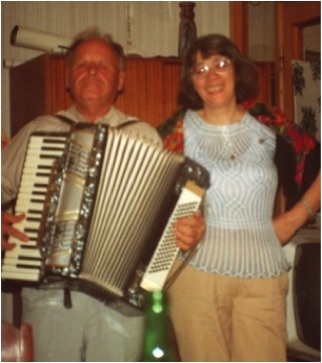 Alice and I had good friends in Germany, particularly Helmut Satz from Bielefeld and Walter Greiner from Frankfurt. Walter had arranged a Humboldt prize for me so that I could visit the University of Frankfurt. Walter is also a major organizer of NATO Advanced Study Institutes. One of these was in Bodrum Turkey, which is a beautiful sea port in Asia Minor. In Bodrum, Alice with Connie Ludlam, the wife of my present colleague Tom Ludlam at Brookhaven National Laboratory, discovered the wooden sailing boats in the harbor. They found a boat with a simple sign which said ``We go to the quiet places; live music with meals’’. She talked to the first mate, and set us up with a day trip. When we met the captain, Cenghiz (pronounced Jenghiz), we were surprised to find that he was blind. Alice quietly learned from the his sailor that he had been blinded while sponge-diving a few years before. (His oxygen equipment failed, and he had to surface too fast.) 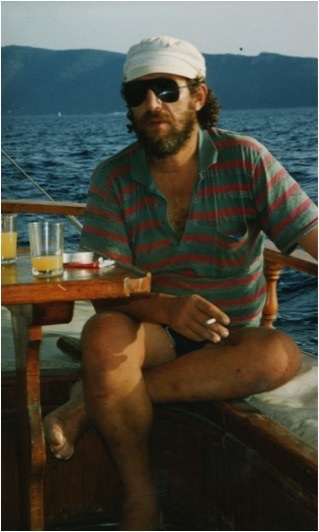 He was mentor to the young sailors in the harbor, knew the sea from memory, and was almost certainly the most skilled captain in Bodrum. I liked him immediately. He is an honest and genuine person who likes Bob Dylan and rum. He would sing in the evening, and he sang well. 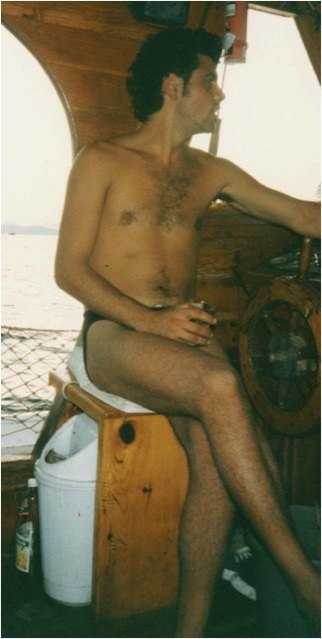 We began staying out at nights on his boat rather than our hotel room. The Adriatic in September has temperate nights and clear skies. The water is almost perfect for swimming, with high salinity. You can literally lie in the water with your hands behind your head, and fall asleep. 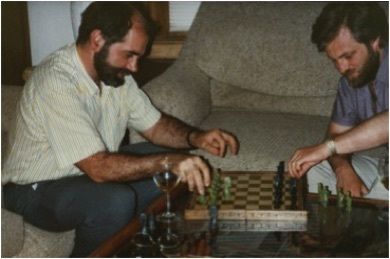 Cenghiz, above and his first mate Cem, on the right. Cem, I suspect, caught Alice and Connie’s attention, and convinced them that this is the boat they wanted to rent. We continued to travel to Russia. One of our more memorable adventures was to begin with a stay in Corsica, then Moscow, and the the Northern Caucasus in the Baksan Valley. Before this trip we were in Aspen. We had hiked into Willow Lake, which involved negotiating a 12,000 foot rugged pass with full backpacks. The first morning at breakfast, Alice slipped and fell and broke her ankle. I had to run all the way out over the summit and back to the road, about 6-7 miles of rough terrain. 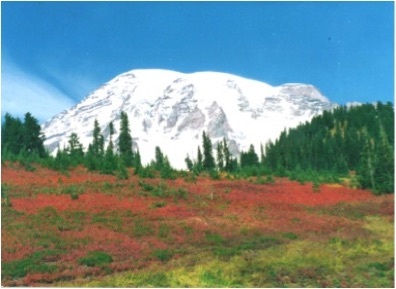 I got to the ranger station about noon, and began arranging getting Alice out by helicopter. The ranger hiked in to stay with Alice. It was not clear they could get her out that day, but somehow they did it. Alice remembers the helicopter flight since they buzzed a huge herd of elk. She had her leg set temporarily, and in a few days flew out to visit her father. The leg was not set properly so in a few days they put in a metal plate and gave her a ``Darth-Vader’’ boot to wear. With her leg freshly operated on, we headed off to Corsica where I was to lecture at Cargese. We were housed in the bottom floor of a hotel along the cliffs. Alice had to climb stairs with my help whenever she had to eat. Next, we flew to Moscow. I was visiting my good friend Valery Rubakov’s group, and Alice and I were invited to tour a city full of ancient and important churches north of the city. She exhausted herself hobbling on crutches; but when we left her to rest on a church porch she reported on our return that a kind old woman had prayed for her, and she was much restored! We then flew to a town called Mineral Water (Mineralnaya Voda) in the northern Caucasus and took a car to the Baksan Valley. The Baksan valley has a famous cosmic ray station run by the Institute for Nuclear Physics where Valery works. It is right next to Mt. Elbrus, the tallest mountain in Europe. When we arrived at our hotel, we discovered it had been taken over by mountaineers from Czechoslovakia. Under Gorbachev, they could easily travel to the Baksan valley, and the roads were full of Trabants, an East German car with an engine roughly that of a small lawn mower. They had used the bathroom in our hotel as a place to wash dishes. In order to keep this from happening, the hotel management had locked all the bathrooms on the first floor. We were the only guests in the hotel. There was also no electricity since the power lines had been washed out in a flood. Alice had an upset stomach, and it was too dark and dangerous for her to go upstairs on crutches in total darkness. The staff of the hotel was nowhere to be found. I tried opening the first floor bathroom with a credit card, and for the first and only time in my life, the trick worked. Alice has always been grateful. I went out hiking in the mountains. These are young volcanic mountains with glaciers which hang blue ice over cliffs surrounded with evergreens. Everywhere you go there are wooden signs with pictures of a young man and a story about his life and how unfortunate it was that he died so young since he was such a good Alpinist. I went out for a long hike with friends one morning, and we went straight up with no switch backs for the entire morning. We reached the top at noon, had lunch and proceeded down. One of the young men I was with was a guide, and he told me to follow closely in his steps. A thin layer of snow became a layer of ice, which developed cracks and soon we were jumping across crevasses. We had no ropes. I got back late in the evening, with knees which no longer worked very well. I am afraid it was not so interesting for Alice. We had moved from the hotel into an apartment. The main entertainment had been to watch the nearby market which had at first been closed begin to accumulate with people during the day when I was gone. Finally a huge truck full of cucumbers arrived, and people picked out the good ones out, leaving about 1/2 which were rotten. The cows came next day and ate what was left. One day, we both took the cable car up to the ski-station on Mount Elbrus. It looks over many miles of glaciated landscape. You cannot see it in the photo, but underneath Alice’s dress is her cast. Yes indeed, Alice is tough. Unfortunately, for many years now, this area has not been safe to go to. The Caucasus have been fought over through all of recorded history, and it continues today. 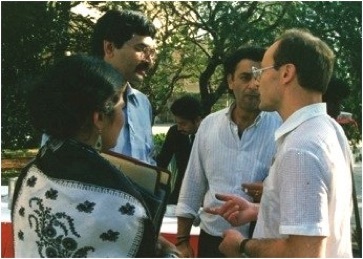 We had also been traveling together in India. The first time Alice arrived in New Delhi, it was about three in the morning when we got out of the airport. We took a cab to the airport, and there was smoke from fires filling the air. In the smoke and dark, there would appear carts pulled slowly and noiselessly by camels. I had been in India once before, and coming back, I wanted us to have some time to travel and stay in some of the old colonial hotels. After some vacation, I was going to the first International Conference on the Physics and Astrophysics of the Quark Gluon Plasma organized by my very good friend Bikash Sinha. I was first to lecture at a school in Jaipur. We visited New Delhi, and took a train to Agra. We stayed in an old hotel run by a very nice family who gave us tea with milk and cinnamon for breakfast. We visited the magnificent ruins of Fatehpur Sikri. This was a city built in the middle ages by a mogul king. After some time, they ran out of water and the town was abandoned. We then took a bus to Jaipur. Along the way, there was a stop and a camel which could be ridden for a small fee. Alice could not resist. I remember she bent forward anticipating the camel rising from the ground by lifting front legs first. Camels lift rear legs first, and Alice almost began the ride falling head over heels over the top of the camel. Once she was up, she was the happiest woman on the planet. Alice has kept her love of camels. 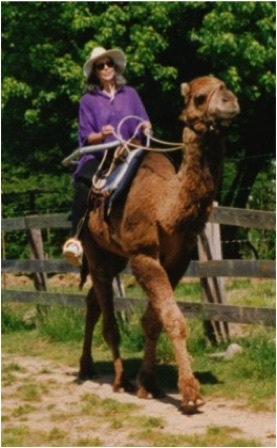 She found that she could get riding lessons in Indiana where at the time the only real camel raiser in America once lived. He was a young man adopted by a Christian couple as a child who while still in college had developed a business raising and training camels, mainly for use in zoos and renaissance fairs. He returned to his homeland, Mali, attempting to open the country to tourism. He was too successful, aroused jealousy, and during a wedding celebration was murdered by an “accidental” gunshot -- a tragic end to a remarkable young life. On the right is a photo of Alice riding a camel in Indiana. Alice has spent much of her life in Ecuador. 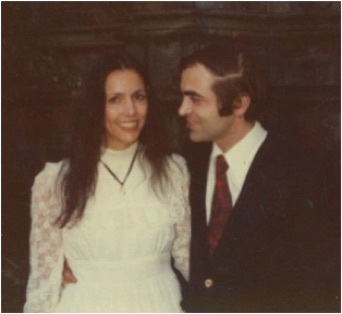 As a 17 year old woman, she was there for a year while her father was the Military Attache; twice she returned professionally to do field work in anthropology. We made two trips together to this country she had grown to love. At one point, we helped support the educations of about a dozen young children. These were associated with the Lema family, who were kind to Alice during her first stay as an anthropologist. This is a remarkable family. On the right you see Alice with the patriarchs of this family. Patty, a woman who had been working for the Lema’s younger son as a secretary, became important to Alice when her closest friend in the family, Narciso, began to suffer from Lou Gehrig’s disease after our second visit. She was the only person willing to care for such a patient that could be found, and she willingly did so until the end, permitting Alice and Narciso to remain in daily e-mail contact through her. 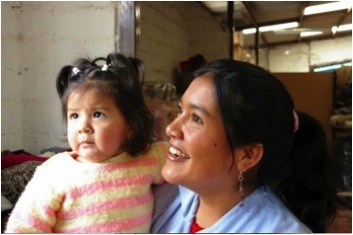 Patty is in the photo on the right with her daughter Angelica. Narciso was a phenomenon. The first indigenous male in Ecuador to graduate from teachers’ college, he built a school so children from his village could attend without having to travel to the larger own of Otavalo nearby; he then built a number of schools for indigenous children. He at one time worked for the US Embassy creating news broadcasts in Quichua (the name for the language of the Incas in Ecuador) until the Embassy grew uneasy about his independence of mind. 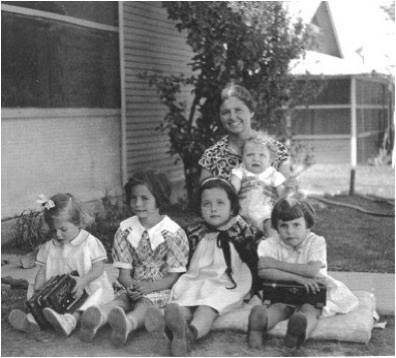 Alice and Patty have remained close ever since bonding as they shared his last days; she is seen with her daughter Angelica in the photo at top right. Alice has a close friend from Ecuador, Yolanda, who helped her during her year of fieldwork, and came to stay with Alice and her family in Berkeley while Alice finished her dissertation. 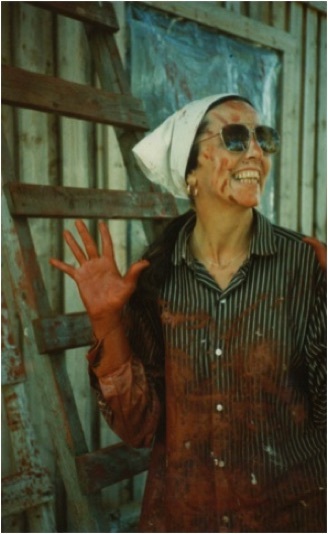 She remained in the US and ran a photography business for years, but then returned Ecuador to be with her mother. The photos to the right show first Alice with Yolanda, and then David and me, high on the slopes of Cotopaxi, and finally Alice and me on a different day -- somewhat lower, with Cotopaxi’s peak behind us. Alice was very proud that day we went up with Yolanda and David, since she was able to climb higher than the mountaineer’s hut, well above 16,000 without any symptoms of altitude sickness. David, her son gave up at the hut -- but he had recently arrived in Ecuador, and we had already been in the Andes for more than a week already. 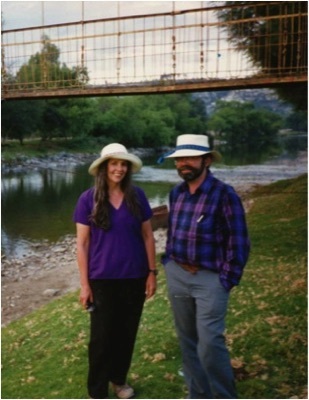 The photo at right shows Alice and me together at a lower altitude, wearing our new ``Panama’’ hats (made in Ecuador). We were heading into the Oriente, and were I think in an area near Baños. The Oriente is the beginning of the Amazon rain forest. Baños is named after hot springs produced by the nearby volcano Tungurahua. Tungurahua erupts about every 100 years. (It has recently been erupting.) 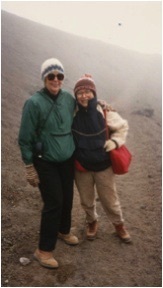 When we hiked on it, the trails were deep in ash from earlier eruptions, and along the slopes there would be huge bushes of flowering plants. 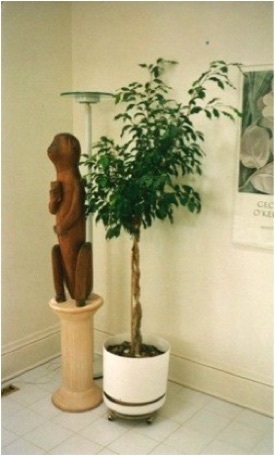 We hired a taxi to take the narrow road into the Oriente as far as Puyo, and there we bought our wooden monkey, shown above in photos of our Minnesota house. He was for sale for $11 in the corner of a sort of general store. While in Baños, we met a young woman who was photographing birds. She had been camping with some naturalists near the broader between Peru and Ecuador, when the group was attacked by bandits. They shouted revolutionary slogans, but they wanted only money and jewelry. She lived through it. Banditry was unusual at the time we were there. It is more common now. A few years after being in Minnesota, Alice got initial reviews on her book Roxaboxen that generated unusually high royalties. This windfall, added to money she had inherited from her father, let us put money down on a vacation home in Oregon. Our ``dacha’’ is in Sunriver, a resort about half way between Seattle and San Francisco. It has enabled us to maintain contacts with family and friends on the West Coast, and provided us with innumerable hours of pleasure. The hiking, biking fishing and skiing are all excellent. We have owned the house in Oregon longer than any other piece of real estate. About 1996, I was offered a professorship at Nordita in Copehagen, Denmark. 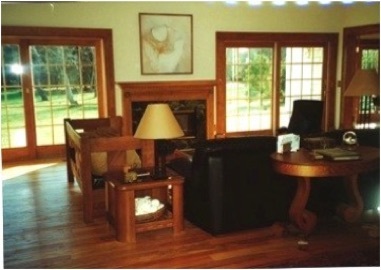 It was not an offer I could accept, as we could not afford to live there and maintain our place in Sunriver. 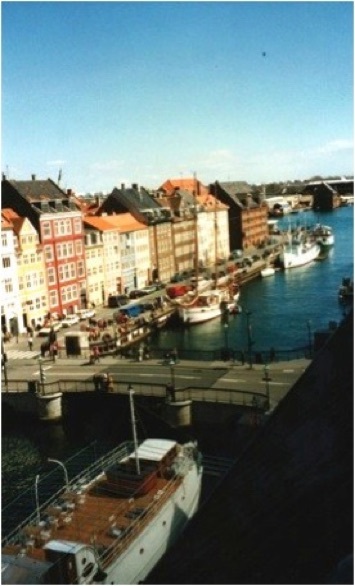 But I made trips there off and on for three years as a visiting professor, and one spring, we spent three months of a sabbatical in Copenhagen We lived in an apartment owned by the Danish national bank. It is on the picturesque street of Neuhavn, and the view from our window is shown on the right. 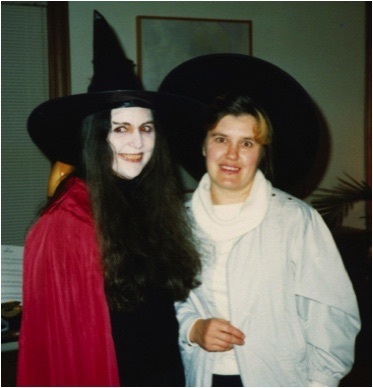 At about the same time, we sold our house in the Uptown area of Minneapolis, and bought a condominium downtown. This was a great move for Alice. Our building was on the skyway, a system by which much of the downtown area is connected by glass walkways at the level of the 2nd floor. In winter, she could go all over downtown and never put on a coat, since she could get to stores, galleries, and all the downtown amenities by the skyway. In 1999, Brookhaven National Laboratory made me an offer I could not refuse. They were beginning to operate the Relativistic Heavy Ion Collider, and I had done much seminal work associated with the physics goals of this machine. They had tried to hire me twice before, but this time they gave me the resources, both financial and administrative, to build a group. More can be found in my Anecdotal Vita. This seemed a most difficult move for Alice. She lived comfortably in downtown Minneapolis as a non-driver, but there was only one town she could survive on foot within commuting distance of the lab: Bellport, a small village with few available houses. The cost of housing in Long Island was then 2-3 times higher than in Minneapolis, so we knew it would be very difficult to find a place. Somehow, by a series of miracles, we found the house where we now live. Very different from the ``fixers’’ on normal city lots that we have rehabbed together, it is a new house with a little more than an acre of land. Still, it took a lot of work to make it the home we now love. Although new, it lacked at the time we bought it many of the things a finished house normally has. We added lighting fixtures, mirrors in the bathrooms; Alice tiled the backsplash area in the half-bath. 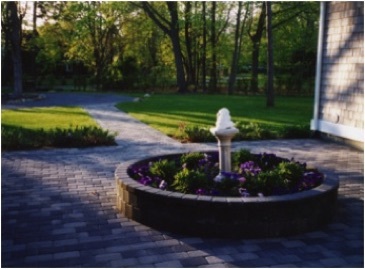 She designed and we arranged to have built first a courtyard in front, then a patio in back. We had drywells dug to improve the drainage in the yard, removed dead and dying trees, planted a lawn. Together, we have designed and built a large garden. In the process, I have become an avid gardener. The view from our front door and our living room. 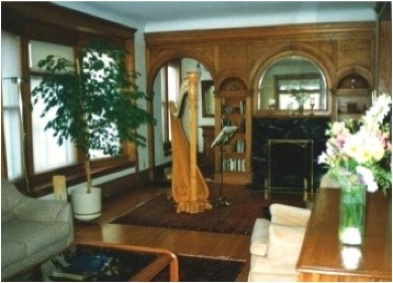 One of Doris’s paintings, over the fireplace in the shot above, has now been moved to another wall; the portrait below now hangs above the mantel. For our 25th anniversary, I commissioned a portrait of Alice. It was done by a well known portrait painter from the midwest, Jeffrey Larson. We chose him because he has a kind eye, and he does masterful portraits that seem to capture something beyond what photos can. It is certainly true that you can never have immortality, but a good portrait is close. I like the portrait since it catches something of Alice’s kindness, her intelligence and her beauty. Alice went to Minnesota and sat for the portrait for several days, from about 10 in the morning until the light failed. She said it was great fun to watch Jeffrey paint. He encouraged her to talk rather than trying to remain silent, and by the end even of the first day certainly had learned something about his subject. Life continues to run at a fast pace for Alice, On her website, you will find a description of our long and eventful trip to Asia, where she launched editions of “The Mountain That Loved a Bird” in English and translation to five languages of the Philippines in Manila, and while I was in Shanghai made a second detour to sign a contract for the same story with a publisher in Changsha. Not too long ago, we went to India together, and then while I headed for some talks in Seattle and a long workshop in Kyoto, Alice had planned fly to Africa. She had promised to help a former fellow-student, a valued friend from years ago, with his memoirs, and hopes to be able to celebrate the appearance of her first editions in East and South Africa. (This trip was canceled due to violence after the presidential elections there.) She claims her goal is to simplify her life -- but I’m not convinced that is in the cards.